I’ve come to the conclusion that vegetables are more challenging than animal proteins, especially when it comes to creating interesting combinations. When you go to a high-end restaurant like Gramercy Tavern or Blue Hill, there are for example, five-course or seven-course vegetable tasting menus. That presents a challenge where a chef needs to structure a meal so that each course offers a different, yet interesting range of colors, shapes, textures and flavors that doesn’t mimic or duplicate from its predecessor. If you think about it, your options become even more limited when you cook seasonally. There’s only so much you can do with potatoes and turnips before things start to become boring. Fortunately this problem doesn’t assert itself all that often in the spring, summer or fall. There’s such a profusion of ingredients available on the market that the only limits in the kitchen are those that spring from your imagination. Melt butter in a skillet over medium heat. Add garlic and sauté until garlic begins to take on a bit of color, about 1 minute. Watch carefully so that the clove doesn’t burn. You want to add the mushrooms when the garlic begins to transform from a pale off-white to slightly golden in color. Cook until the mushrooms have absorbed the liquid in the pan and soften, then add a splash of beer. If you don’t have beer on hand, you can use white wine. There’s a saying that holds true when it comes to cooking with alcohol — if you wouldn’t drink with it, don’t cook with it. When you use alcohol in recipes, the flavors become richer, adding depth of flavor to the final dish. That’s why it becomes important to use a quality ingredient and not something like Bud Lite. When you add wine or beer to a hot pan, the alcohol will evaporate, while other flavors become more concentrated. A fruity wine such as a riesling or a banyul will concentrate those flavors and give a rather fruity flavor to the final dish. A sweet wine such as a Beaujolais or a sherry will provide sweetness to the final dish. “Cooking wine” from your corner supermarket will end up concentrating the salt, making your food saltier. For this recipe, I used Ommegang Abbey Ale, a dark red-hued beer with notes of clove and spice. About 30 seconds after you add the beer, add the fromage blanc. If you don’t have fromage blanc, you can substitute Greek yogurt or low-fat sour cream. Cook until the fromage blanc becomes incorporated into the mushrooms, stirring occasionally. Fold in the garlic scapes. Remove from heat, check seasoning and serve. Melt a pat of unsalted butter in a large skillet. Add the ginger root and sauté until ginger becomes fragrant, about 30 seconds. Add the peas and cook, stirring frequently, or until peas turn a bright green and are glazed with the butter. Peas should have a faint sheen to them. Remove from heat and check seasoning. Stir in some chopped parsley and serve. Toss potatoes with olive oil, a pinch of salt and some freshly ground black pepper. Roast uncovered in a Pyrex or glass baking dish in a pre-heated 375 F oven for 30 minutes or until potatoes are golden brown. When potatoes are done, stir in the juice of half a lemon and scatter some chopped thyme. Serve. The egg is from Quattro’s Game Farm in Pleasant Valley, New York. It was poached in barely simmering water to which I had added a teaspoon of white wine vinegar. You can leave out the vinegar if you wish, however I find that it helps coagulate the egg white. Lift out with a slotted spoon when the egg is done, about 3 to 5 minutes, depending on how firm you like your yolk. 17 Jun	This entry was published on June 17, 2009 at 11:51 am. 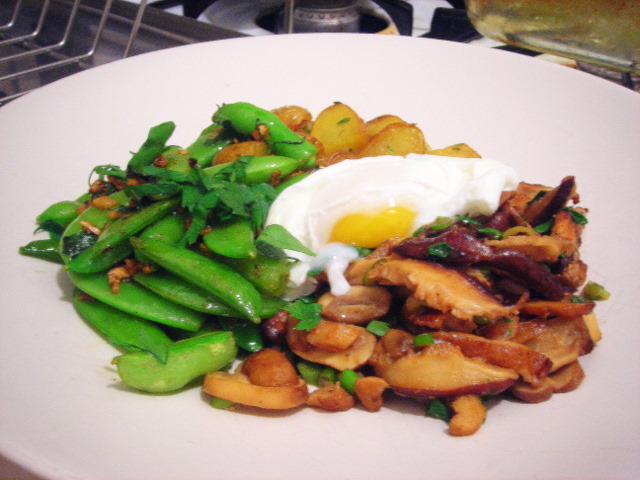 It’s filed under food, general, vegetarian and tagged cooking, dinner, eggs, fresh, garlic scapes, mushrooms, peas, potatoes, recipe, vegetables, vegetarian. Bookmark the permalink. Follow any comments here with the RSS feed for this post. I love your site, it’s so unique and heartfelt. I read your comments regarding Obama on Father Tony’s site regarding Obama and the link to your comments on his election. I felt as though a brick hit me with your conclusion the man with Hope and another guy from Hope.